The last time I was on a bike, I did not wear a helmet. Neither did anyone around me. I was in Seoul, Korea, visiting friends (3 public health masters on 1 trip). We rented bikes and rode on an easy path along the river. There were families walking, skating, and riding all around us. Afterward, we had a fried chicken picnic delivered to us at the park (people of Korea, outdoor chicken delivery is genius). Then wandered around a night market where I bought Che Guevara socks. The day was so perfect that I didn’t even realize my helmet oversight until I was looking at pictures the next day. Whereupon I immediately confessed my transgression to DHem via email*. In this past Sunday’s Times opinion pages, Elizabeth Rosenthal makes the case for repealing helmet laws to encourage biking. 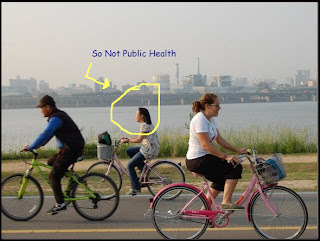 Rosenthal uses the example of European cities where biking is prevalent and helmet laws rare to argue that helmet laws discourage people from riding bikes and the health benefits of riding far outweigh those of helmet wearing. Mayor Michael Bloomberg is noted as rejecting calls for a mandatory helmet law when New York’s bike share program rolls out next year. Despite my idyllic Seoul ride, Rosenthal’s piece misses the point. As our bikers noted last month, the type of safe, biker-only, slow-speed riding environment I encountered (and Rosenthal alludes to) is rare in the US. Bikers, especially commuters, ride at high speeds among cars. The 20-to-1 cost-benefit analysis Rosenthal touts depends on 2 assumptions that aren’t readily met in much of the US: safe riding environments and the belief that people view biking as a mode of commuting rather than exercise (and thus will not make up for not biking with other exercise). Bike accidents may be rare events, but riding with a helmet is always safer than riding without one. Rather than repeal helmet laws, there are better solutions using principles this blog has covered (like looking for ways of reducing the ‘cost’ of helmets and barriers to use through helmet giveaways, making rentals available, and creating biker-only lanes). Rosenthal also missed an opportunity to push for changing the riding culture in the US the way we have with cigarette smoking. Though warning labels may be larger in Europe, the US has been more successful at transforming perceptions of smoking and lowering cigarette use. The US is raising up generations of non-smokers (the recent college bans in the news being one indicator of this success) who grow up in smoke-free environments and we can aim for the same for bike safety. Policy Implication: Making bikers safer begins with improving the riding environment, not repealing helmet laws. *One of these days, I will stop mentioning DHem and/or bike safety in every post. Just not today. Even Bobby Valentine can see the merits of wearing a helmet (http://www.nytimes.com/2012/10/03/sports/baseball/bobby-valentine-injured-after-reading-text-while-cycling.html?_r=0).